Moving to an Aged Care Home is inevitable for most Australians and whether it’s for you, or for a loved one, it’s important to understand the potential costs involved. At some stage in your life you may be faced with the financial responsibilities associated with Aged Care Homes. To plan for the future, and avoid encountering any unwanted surprises, it’s important you become familiar with the services, fees and the government assistance available. Anybody entering an Aged Care Home in Australia can be asked to pay the basic daily fee for residential care if their financial situation suggests they are capable of doing so. The rate for the basic daily fee is calculated at 85% of the single person rate of the basic Australian Aged Pension. This rate applies for both single residents and couples. The basic daily rate may increase each year inline with any changes to the Aged Pension, and is adjusted twice a year on the 20th of March and the 20th of September. Click here for a useful calculator to find the potential residential care fees you could be liable for. There is an additional fee, known as the Means-Tested Care Fee, that you may be required to pay based on an assessment of your income and assets by the Department of Health and Services. If you are in a couple, your combined assets and income will be assessed together, regardless of who owns the asset or differences in income. There is both an annual and lifetime cap applied to the means-tested care fee, regulated by the Australian Government, limiting the amount you will have to pay and includes any income-tested fees already paid towards home care packages. The Australian Government may cover your Accommodation Fee if you are eligible and your qualification will be based on an assessment by the Department of Health and Services. Your assessment in this area is similar to the means-tested care fee in that couples are assessed on their combined assets and incomes. You may be faced with additional fees when entering an Aged Care Home with a higher standard of accommodation or one that offers additional services like pay TV. 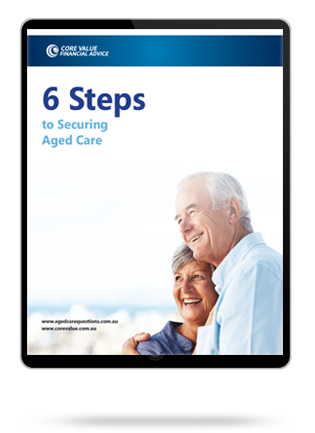 The best way to find these additional costs is to call the Aged Care Home or visit their website for details. What is Guardianship in Aged Care? The Australian Government aims to make aged residential care available for all Australians by subsidising a number of aged care services. Your eligibility and the level of assistance you receive for the Australian Government depends on the assessments conducted by the Department of Heath and Services mentioned earlier. If at any time you feel you cannot pay your fees due to financial difficulties, you may be eligible for Financial Hardship Assistance. Likewise, if you are a veteran you may be eligible for assistance from the Department of Veterans’ Affairs. To get the best advice, regarding the payment of your fees, it’s always a good idea to consult your financial adviser first before moving forward.